Your cells have an amazing ability—they can build their own energy factories, called mitochondria. Once built, mitochondria must move where needed in the cell. Defects in mitochondrial transport are a suspected cause of diseases including Alzheimer's, ALS, Huntington's and Parkinson's. Scientists at Scripps Research have discovered how neurons manage this important process by studying cells from Aplysia californica, a type of sea slug used in neuroscience research. The paper, published this week as the cover story in the journal Cell Reports, may help open the door to new therapies to improve mitochondrial transport, says neuroscientist Sathyanarayanan Puthanveettil, Ph.D., an associate professor at Scripps Research and senior author of the new study. "We are very interested in looking at this process in neurodegenerative diseases," Puthanveettil says. "If you can find potential drugs that can manipulate transport, that might be beneficial." 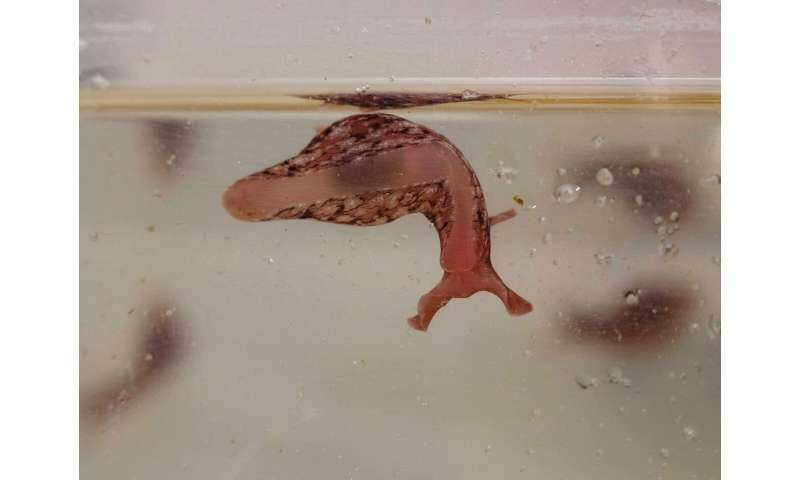 Puthanveettil's team set up the sea slug neurons to grow in dishes. Some neurons grew alone, and others grew alongside partners. In neuroscience lingo, the cell that sends a signal is called "pre-synaptic" and the cell receiving the signal is "post-synaptic." Because the slugs' brain circuitry is simple, and their cells are larger, they are a useful model organism to study, Puthanveettil explains. Neurons have elongated projections called axons that allow messages from the pre-synaptic neurons to reach the post-synaptic neurons. At the end of each axon is a busy chamber called a synapse that transmits the message from one to the other. This system requires a great deal of energy to function, so cells transport mitochondria toward their synapses to provide that energy, Puthanveettil says. Older mitochondria move back to the cell body for recycling. Puthanveettil, first author Kerriann Badal and their colleagues wanted to uncover the mechanism in cells that starts the transport process. To do this, the team monitored mitochondrial transport as they tried activating different signaling pathways. The experiments led the researchers to pinpoint a signaling pathway called cAMP as a major player. Once a neuron has grown a synapse, cAMP is activated and appears to step in to enhance mitochondrial transport. 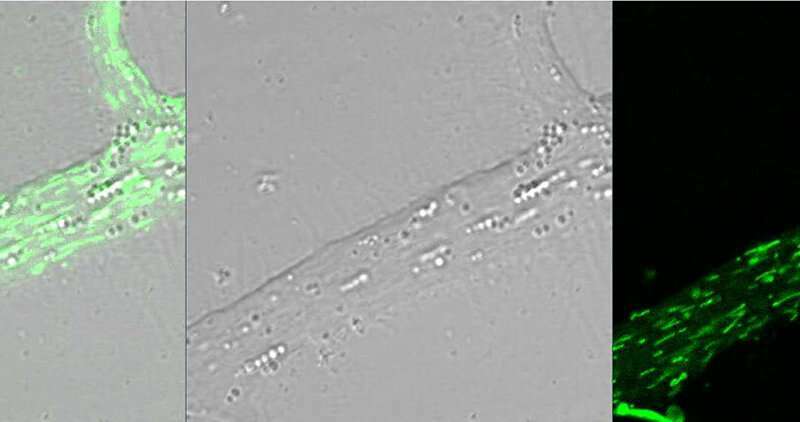 Significantly, the team found that the pre-synaptic neuron alters expression of around 4,000 genes (possibly around 20 percent of the genes it has) as it makes new mitochondria. "The pre-synaptic neuron's identity is almost completely changed," Puthanveettil says. This identity shift appears persistent, too—the cell doesn't just make mitochondria in a quick burst. Instead, protein synthesis permanently changes to support the building and transport of new mitochondria. This supports the previous finding that a massive amount of energy is needed to maintain pre-synaptic function and keep the cell communicating with its neighbors. "We've discovered a fundamental mechanism responsible for higher brain function," says Puthanveettil. Puthanveettil says this discovery was surprising for two reasons: First, the realization that mitochondrial transport increased after the synapse was built, not before. Both processes require a lot of energy, so it was interesting to discover that maintaining the synapse seems to require more energy than the initial building process. Also, the researchers did not expect to see the production of so many new mitochondria. Many scientists had assumed that enhancing transport would simply jump-start the movement of the many mitochondria that tend to stall along transport lines. Puthanveettil says future studies could look at how to design a drug therapy to enhance transport in diseases where transport is defective. He is also studying how mitochondrial transport changes in response to learning and memory formation. Mitochondria is an endosymbiont, so it is more descriptive to say that most eukaryotes "grow" and regulate mitochondria.